Lamb is the traditional main course for spring religious holidays. Big roasts, legs or Frenched racks are so holiday worthy. But what if it's only a celebration for two? There's no reason not to buy a few lamb chops and do, by all means, ask the butcher to French the bones because we're being fancy and all. While you're chatting up your butcher, ask him or her where their lamb comes from. 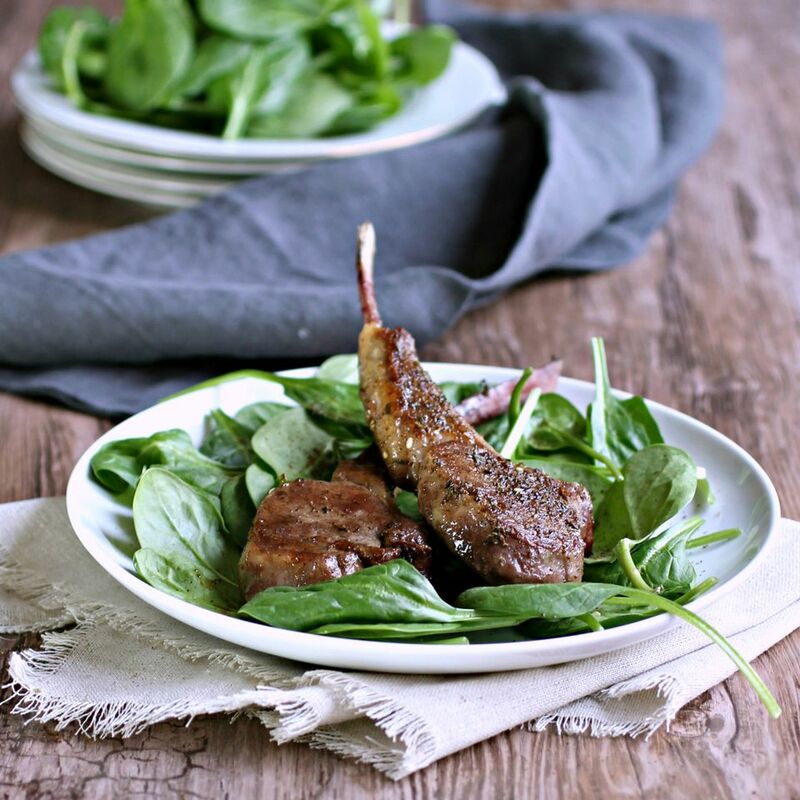 New Zealand lamb is more commonly found and slightly less expensive than American lamb. New Zealand lambs are typically pasture raised and contain slightly less fat and marbling. The taste is a bit more gamey than their American, grain fed cousins. I'm not a big fan of game meats so I prefer the American lamb but choose your preference. I've never been much for typical mint sauce that often accompanies lamb but za'atar is a great match. Get your pan screaming hot so that you'll get a great sear on the outside of each lamb chop. Then just finish cooking them in the oven to whatever degree of doneness you like. Serve with some mashed potatoes, to take advantage of the pan gravy, and you have a holiday worthy meal for two that was quick and easy to make. Season each lamb chop with an equal amount of the za'atar on both sides. Heat the olive oil in a large skillet or cast iron pan. When hot, add the lamb chops and sear on high heat for 2 minutes on each side. Place in the oven for 5 minutes, flip chops and continue cooking for an additional 5 minutes. Chops will be medium rare at an internal temperature of 145 degrees, medium at 160 degrees and well done at 170 degrees. Continue cooking until you've reached your desired temperature. Remove the pan from the oven and move the cooked chops to a plate and cover with aluminum foil to keep warm while you make the sauce. Place the pan on medium low heat on the stove top and add the tablespoon of butter. Whisk in the flour until fully coated and then whisk in the beef stock. Continue cooking until the sauce has thickened. Season with additional salt and pepper, if needed, and pour over the cooked lamb. Serve over a bed of mashed potatoes or greens.